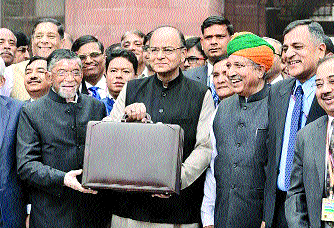 After the bold step of demonetization in November, three months later, finance minister Arun Jaitley unveiled a budget which aimed at helping the poor and middle class with hikes in government spending and tax breaks. The Government announced spending increases on rural areas, infrastructure and on fighting poverty, and sought to allay fears that the effects of demonetisation would not spill over into the next financial year, ahead of polls to crucial state assembly elections where the cash ban and the Modi Government's report card at the centre will be electoral issues. Mr Jaitley announced halving of the basic personal income tax rate to 5 % for those earning between Rs 2.5 lakh to Rs 5 lakh, and cut taxes on small firms annual earnings of up to Rs 50 crore that account for 96 % of India's businesses to 25 % from a current 30 %. While imposing a 10 % surcharge on those earning between Rs 50 lakh and a crore. A 15 % `rich' surcharge already exists on those earning more than a crore of rupees. Officials explained that the lower tax rate at the entry scale was meant to give relief as well as to encourage people such as small traders etc., who were avoiding paying taxes to pay up and avoid being troubled by the taxman. The stock markets, relieved at the absence of a feared increase in tax on dividends and a new impost on stock market transactions, welcomed the budget with the Sensex leaping close to 486 points to close at an over 3-month high of 28,142, on the budget day. The Prime Minister Narendra Modi who is believed to have personally held a series of meetings with secretaries in the run up to the budget himself termed the Union budget presented by Mr Jaitley as "Uttam" (Great). With economic growth slowing down to 7.1 % in financial year 2016-2017, the finance minister had a tough task on hand - he needed to push the envelope and inject more money into the economy to try pep up growth, please the middle class left unhappy by the cash ban with tax sops, woo farmers bitter because of lack of cash during the sowing season and help traders and small businesses trying to limp back to normalcy. The Government decided as a consequence to raise capital investment by a whopping 25.4 %, hoping this would lead to a multiplier effect in the economy. Some Rs 2.41 lakh crore was promised as spending on rail, road and shipping. While the farmers' were promised Rs 10 lakh crore in credit and better crop insurance coverage. The finance minister also announced a 24 % hike in rural and farm spending as part of Modi's commitment to double farm incomes over five years. A series of sops were announced for affordable housing schemes, realtors were promised industry status, which would make loans cheaper and easier for them and a bond was promised investment in which would be set off against capital gains liability for those selling their property. Rs 3 lakh were banned. Firms will now on be allowed to claim expenditure in cash, only up to Rs 10,000 and cash donations to charities limited to Rs 2,000. However, to try and garner money for these spending plans and give-aways, the Finance Minister has had to ease his fiscal deficit target from an earlier set 3 % to 3.2 % or by over Rs 32,000 crore. Possibly one of the few bold moves taken in the budget was a move to sanitise political funding by introducing an Electoral Bonds, which can be bought from the market with legitimate money through cheques or through digital transactions from designated banks and given to the political party of the buyer's choice. The electoral bonds are an unique experiment for which the Government will have to bring legislative changes, which officials have said are in the offing. The bonds will be authorised by the Reserve Bank of India and a scheduled bank or banks will be authorized to issue the electoral bonds. Anyone who wishes to contribute to election funding can buy the bonds with legitimate funds. It can then be contributed to any recognized political party's designated account. The party can then cash it for its election expenses. By buying the bond and then giving it to the party of his or her choice and individual or firm is able to maintain a veil secrecy in who he or she is funding. The Government announced in the budget that cash contributions to political parties will be limited to 2000 instead of the earlier limit of `20,000 and that contributions above that can either be through cheques or electronic transfers or by way of anonymous bonds which can be legitimately bought and then given to any political party of a firm's or individual's choice. The move comes just days ahead of key elections to state assemblies including India's most populous state - Uttar Pradesh. In another bold announcement, the finance minister said the Foreign Investment Promotion Board, a stodgy bureaucrats club which vets foreign investments would be scrapped a move that is sure to cheer investors struggling against India's red tape, which has kept India at a lowly 130th position in the World Bank's Ease of Doing Business ranking, despite jumping 12 spots in the last year. In a year which could be marked by economic turbulence stemming from demonetization at home and unfavourable global winds rising from US fiscal policies and protectionist measures which could hit emerging markets, the government decided to take the easy route out on fiscal deficit, by relaxing norms and fixing a fiscal target of 3.2 % for the year 2017-2018. Announcing his decision to relax the target for fiscal deficit, finance minister Arun Jaitley promised to keep to a target of 3 % for the next year. He pointed out that a committee had recommended 3% fiscal deficit for the next three years, but also left an escape clause. " The Committee has also provided for 'Escape Clauses', for deviations upto 0.5% of GDP, from the stipulated fiscal deficit target. Among the triggers for taking recourse to these Escape Clauses, the Committee has included "far-reaching structural reforms in the economy with unanticipated fiscal implications" as one of the factors. The Government had earlier set a road map for fiscal deficit targeting by setting a 3 % deficit for the year 2017-2018. The decision to relax fiscal deficit came about as realization dawned the finance ministry team that the big spending push they were planning could hardly be funded by the tax revenues they could hope to gather in a what promised to be a year when the economy would be slowly coming back to normal after demonetization. Critics caution even this 3.2 % may prove difficult to achieve if certain revenue targets do not work out. Besides a steep tax revenue collection target of `12.27 lakh crore, nearly 12.5 % more than what was collected last year seems at first sight to be a tall target. Also difficult to attain would be a disinvestment target of `72,500 crore, given that global GDP growth will be patchy and stock markets would be in turmoil reacting to American fiscal policies and global protectionist tendencies. However, the Finance Ministry is quite certain that it will be able to meet the target. The Finance Ministry has indicated that the huge spending plans of the Government, an unprecedented `21.47 lakh crore, the largest budget spend till date for India was part of plans to transform the economy. Since 2016-17, India has not only been able to raise the money needed to fund our spending budget but also spend it. In earlies years, the government used to resort to cutting expenditure to balance books. However, now the Government feels that after several years of cutting revised expenditure below the budgeted expenditure, it has been able to reverse the trend. The revised expenditure (for 2016-2017) has as a consequence gone up by `34,000 crore. `2,47,500 crore in 2016-2017 to `2,75,000 crore in 2017-2018. Corporate taxes similarly are expected to rise by 9 % from `4.93 lakh crore to ` 5.38 lakh crore. Customs Duty which for the last few years has depended on imposts on crude oil is expected to rise by 12.9 % from `2,17,000 crore to `2,45,000 crore. The government is assuming that crude prices will stay within a range of $ 55-60 a barrel, which may prove to be a heroic assumption given that the Opec or organization of oil producing countries has decided to slowly push up prices. Though the Government took credit for lowering the net market borrowing of Government to `3.48 lakh crores after buyback, much lower than `4.25 lakh crores of the previous year, in case of revenue slippages this figure could well have to be revisited. *India's tax to GDP ratio is among the lowest in the world. The finance minister explained that as against estimated 4.2 crore persons engaged in organised sector employment, the number of individuals filing return for salary income are only 1.74 crore. *As against 5.6 crore informal sector individual enterprises and firms doing small business in India, the number of returns filed by this category are only 1.81 crore. *Out of the 13.94 lakh companies registered in India upto 31st March, 2014, 5.97 lakh companies have filed their returns for Assessment Year 2016-17. *Of the 5.97 lakh companies which have filed their returns for Assessment Year 2016-17 so far, as many as 2.76 lakh companies have shown losses or zero income. 2.85 lakh companies have shown profit before tax of less than `1 crore. 28,667 companies have shown profit between `1 crore to `10 crore, and only 7781 companies have profit before tax of more than `10 crores. *Among the 3.7 crore individuals who filed the tax returns in 2015-16, 99 lakh show income below the exemption limit of `2.5 lakh p.a., 1.95 crore show income between `2.5 to `5 lakh, 52 lakh show income between `5 to `10 lakhs and only 24 lakh people show income above `10 lakhs. *Of the 76 lakh individual assesses who declare income above `5 lakh, 56 lakh are in the salaried class. The number of people showing income more than `50 lakh in the entire country is only 1.72 lakh. *The Minister pointed out that in contrast, in the last five years, more than 1.25 crore cars have been sold, and number of Indian citizens who flew abroad, either for business or tourism, is 2 crore in the year 2015. Government officials said these could be consolidated under three main themes for the current budget - transforming the economy, energising it and cleaning the system.